Way to go. Good start. We’re all watching for you here at D4Cs. 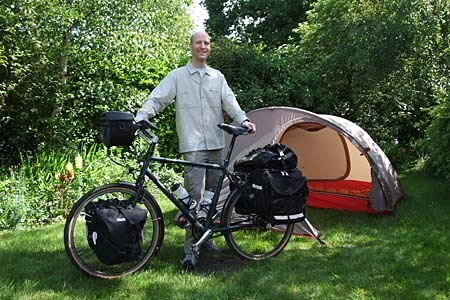 Your bike looks really good – can definitely stand up for the trip. I’m following you on Google Maps too! Graeme told us of your travel plans. How exciting! We are enjoying it and will continue to follow your progress. It’s great to be a part of your journey! The trip seems to be off to a fantastic start! Let me know when you’re gonna be rolling through Bucharest. We’ll be arriving there on the 17th of July. Thus far, we’re planning to stay in a hotel for a while. Hopefully, we’ll have our housing situation sorted by the time you get there. Interesting reading..the big adventure has started. Use a lot of sun screen, wear a helmit and post more pictures olz. We will follow your progress here at Nihonbashi.